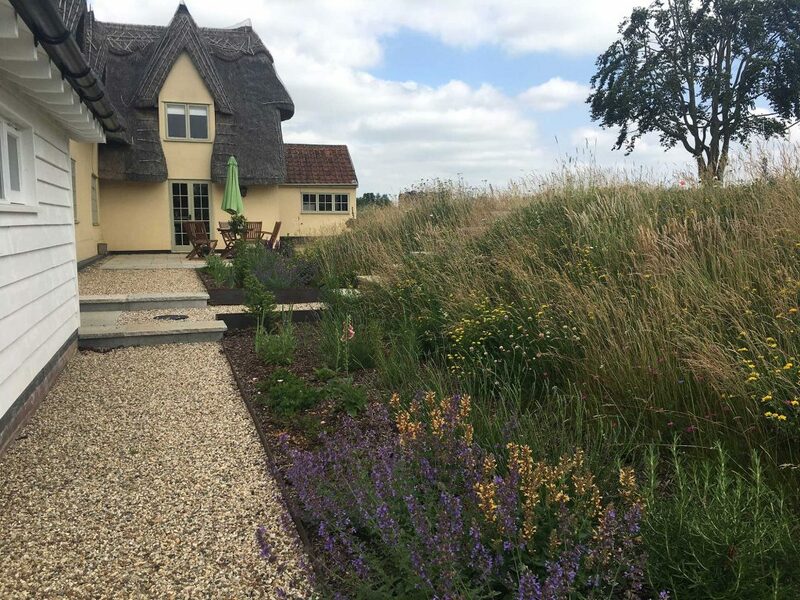 Find out how Holland Landscapes transpired an uninspiring space near Ongar into a well-loved country garden whichthe family uses all year round. If there’s one thing that makes me sad, it’s outdoor space that is unloved and underused. This project started as just that. 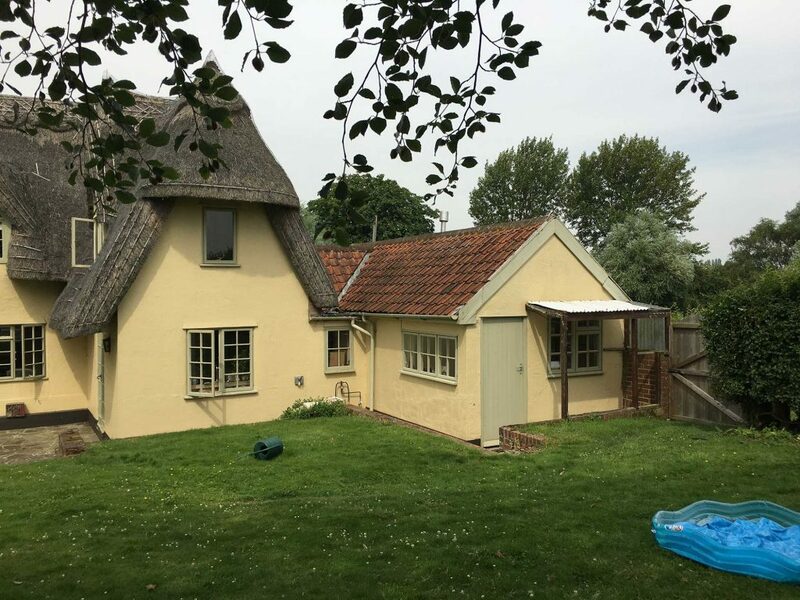 This beautiful traditional country cottage is at least 300 years old and bursting with character. It has a thatched roof, butter coloured walls and it’s the kind of place that makes you go “oooooooo” when you drive past it. Surrounding the property is a generous sized plot overlooking paddocks and farmland. Sadly though, the garden, although well maintained, had nowhere to sit or play and nothing to support the wildlife that you would expect to find fluttering around a property like this. 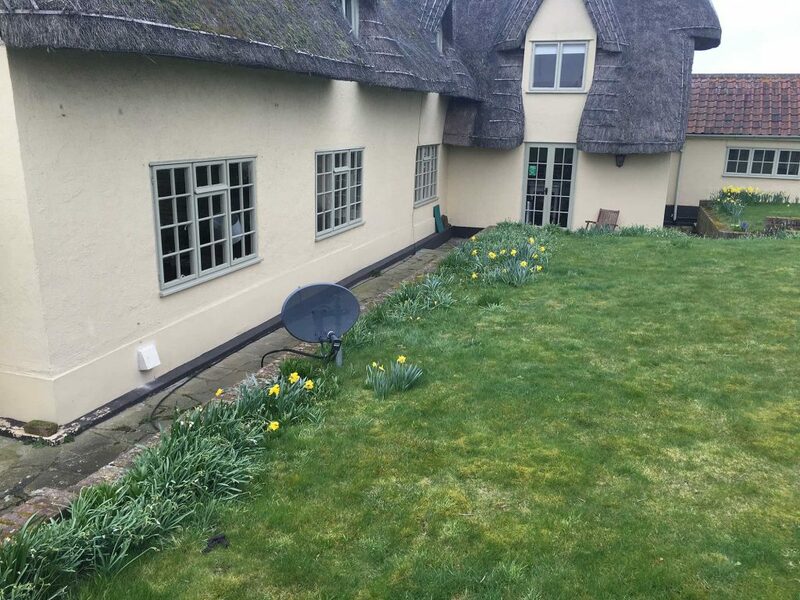 What it did have though was bucketloads of potential, and fabulous views of the surrounding countryside and an owner who was desperate to improve the usability. The client approached Tapestry Design Studios for ideas. She knew that she wanted the house to feel less enclosed. She wanted safe places for the children and dog and she wanted an area where she could entertain friends or just enjoy a quiet morning coffee. The team at Tapestry Design Studios wasted no time in creating a truly inspirational design that perfectly suited the character of the house and would work well with the owners’ lifestyle and taste. 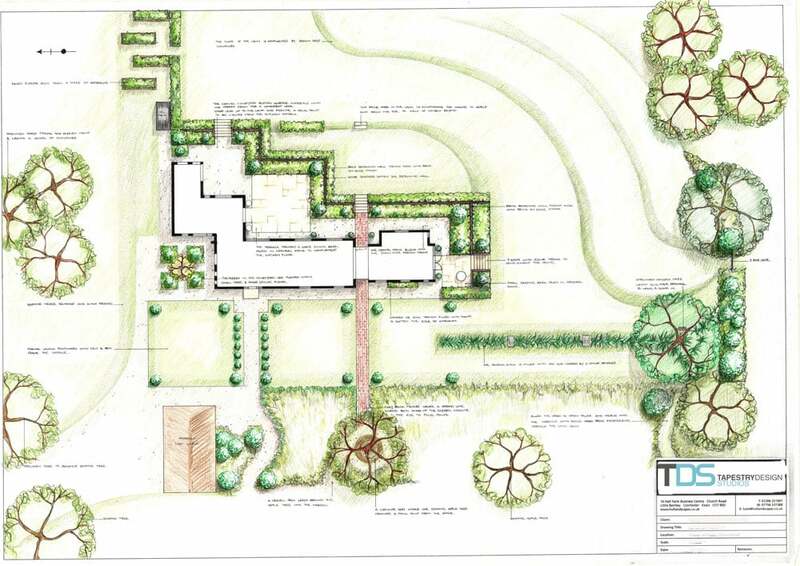 This well drawn out plan helped the client to visualise his garden-to-be and he found it easy to follow the progress of the build. Implementing the design was not without its challenges. But that’s what made it so interesting. As with most garden transformations, the biggest challenge came first. 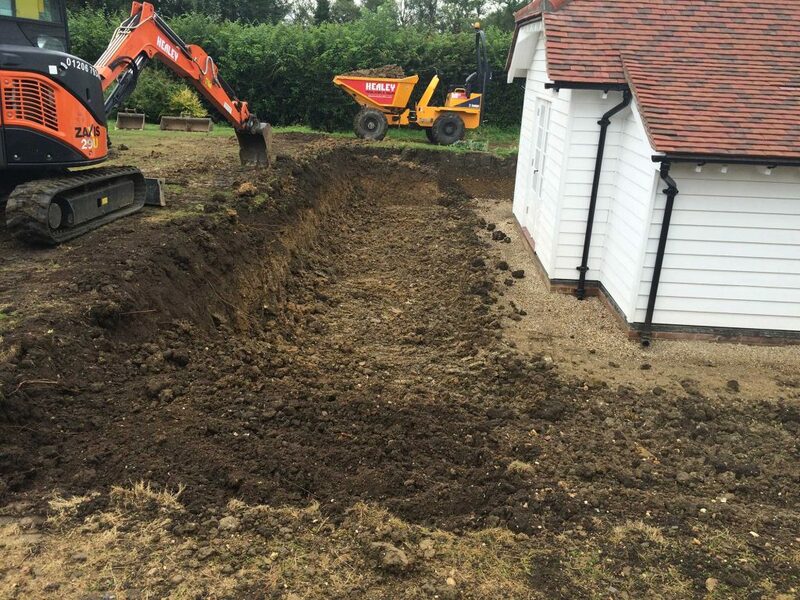 Our first job was to re-contour the site, improving the drainage and making more space beside the house. This image shows just how characterful the cottage is. 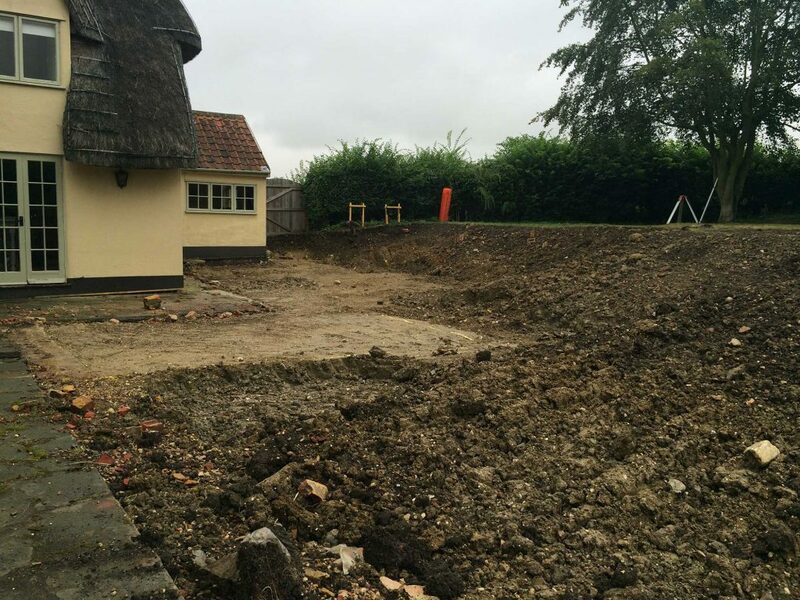 Stage 1 of the landscaping involved creating more space adjacent to the house. We’ve created much room for an al-fresco dining area and at the same time allowed more light into the cottage. Luckily access here is superb – one of the joys of working on a large, isolated site. That meant we could bring in some big machines to get the work done quickly. It would have taken a long time for Ben to clear the decks with his wheelbarrow and shovel. 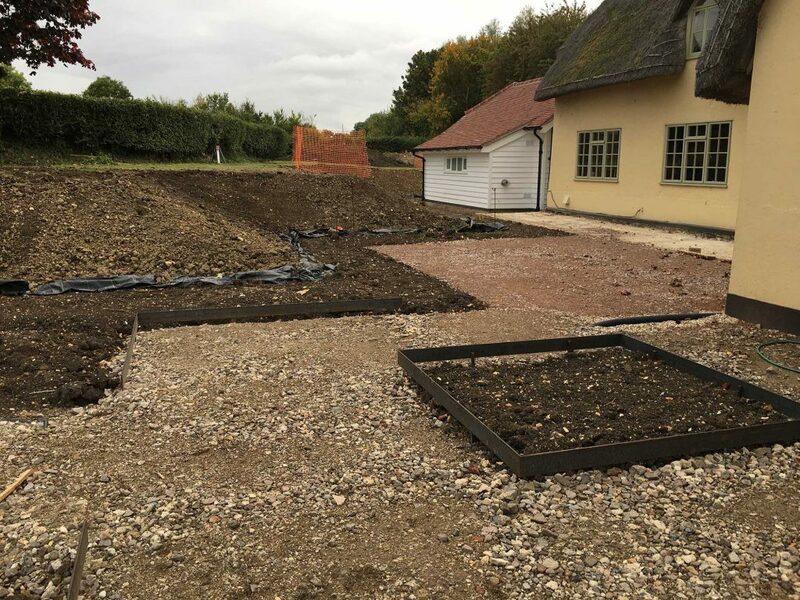 Hard landscaping provided the stucture for the garden, and once that was well underway the client could see his new country garden emerging from the mud. The path leads the eye straight to the front door. I love how the irregular sized stones create interest in what could be quite a cold, hard looking feature. 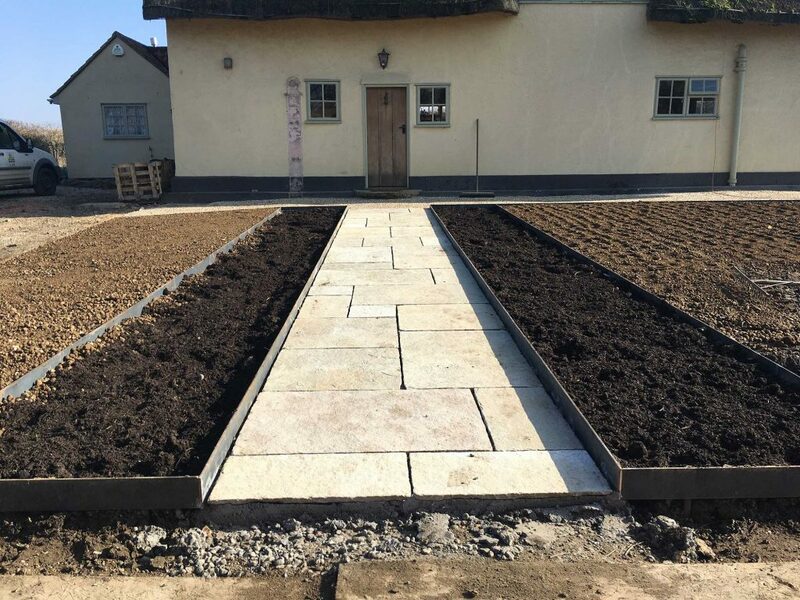 This type of paving makes the path look older too – more in keeping with the rest of the property. Tapestry’s choice of tumbled limestone pavers was perfect. The colour works beautifully with the buttery colour of the house walls and it looks as though it is as old as the house. I do love working with black basalt and porcelain pavers but they would have looked just awful on this project. This just highlights how valuable a good garden designer can be. The path and driveway was created using NidaGravel. Gravel is stabilised by a matting. It still has that lovely natural look with texture and crunch but doesn’t wash away in heavy rain or get compressed by heavy traffic. This started as a very open site with easy access to the road. The client wanted a safe place where his children and dog could play. Tapestry echoed the painted timber cladding on the house extension in their choice of picket fencing and gates. Again, this has a more traditional look and feel to it. And, speaking as someone who lives with two dogs and a 4 year old boy – the finished fence is pretty much escape-proof. Using a combination of surfacing materials helps create year round interest. This photo was taken in early spring. The planting is immature and there’s still a bit of work to be done, but that paving/gravel/woodchip combination looks bright and fresh. 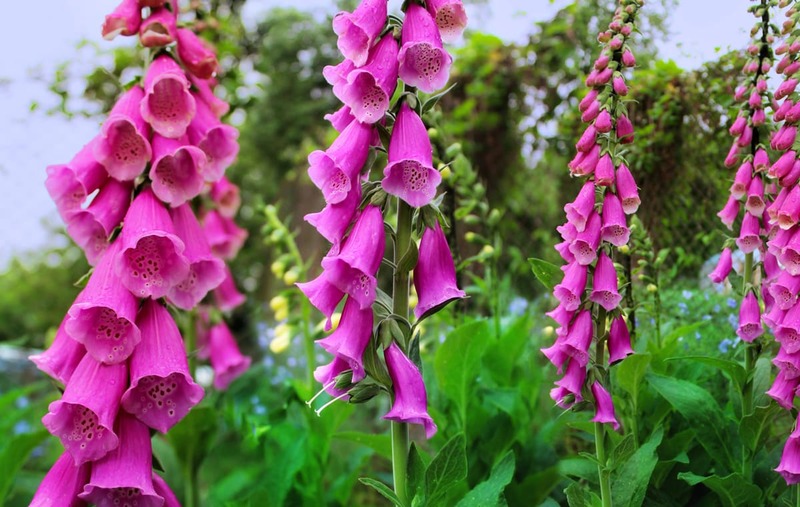 One of the reasons for the original planting being minimised was typical of a country garden. Rabbits. Rabbits have voracious appetites and lovely soft garden plants are irresistible to them. Tapestry’s planting plan used a simple palette of really robust plants. Scented shrubs line the path to the front door. 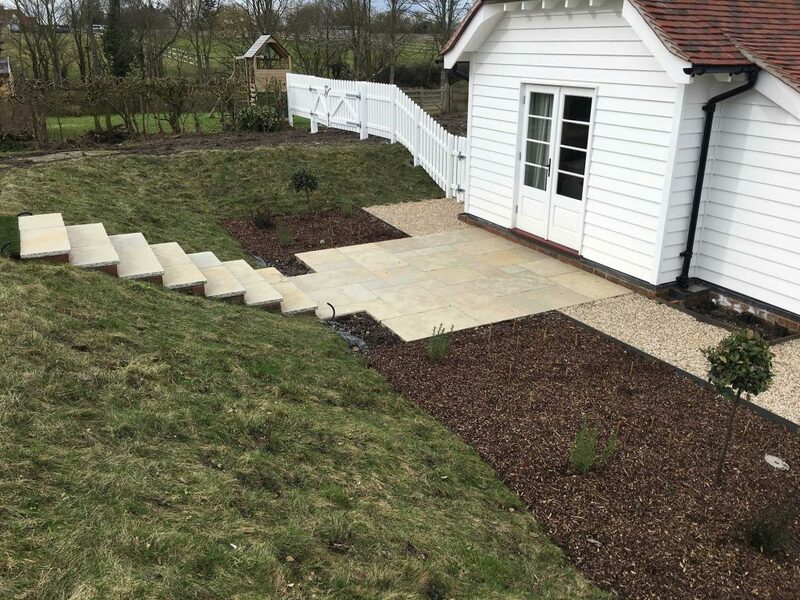 The slope between the patio terrace and the informal lawn is stabilised by Meadowmat. 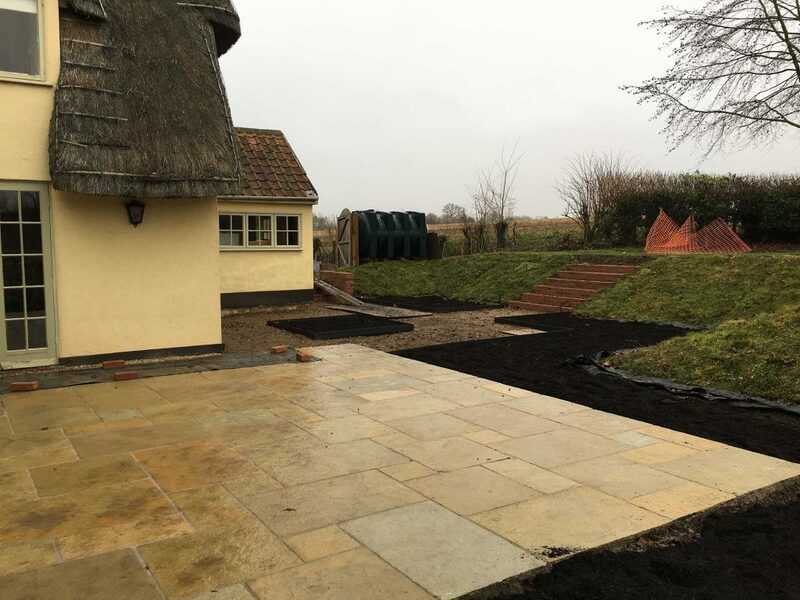 A pre-planted wildflower turf which is happily also very low maintenance. Standard bay trees give height and rhythm to the garden. Early summer and the planting is beginning to settle in nicely. The nepeta in the foreground and the wildflowers on the slope attract lots of bees. What a difference. Our client now has a relaxed and intimate seating area. The garden is a safe play area for children with plenty of features to fire their imaginations. It’s also very pollinator friendly. Could you see yourself in a country garden like this one? 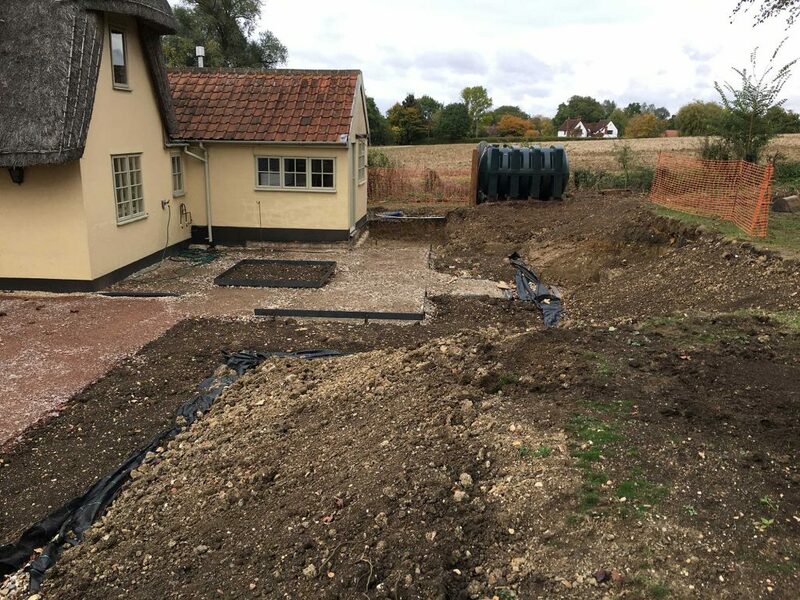 Not every space needs major groundworks to turn it into a useable country garden. Neither does your home need to sit in ¼ of an acre. 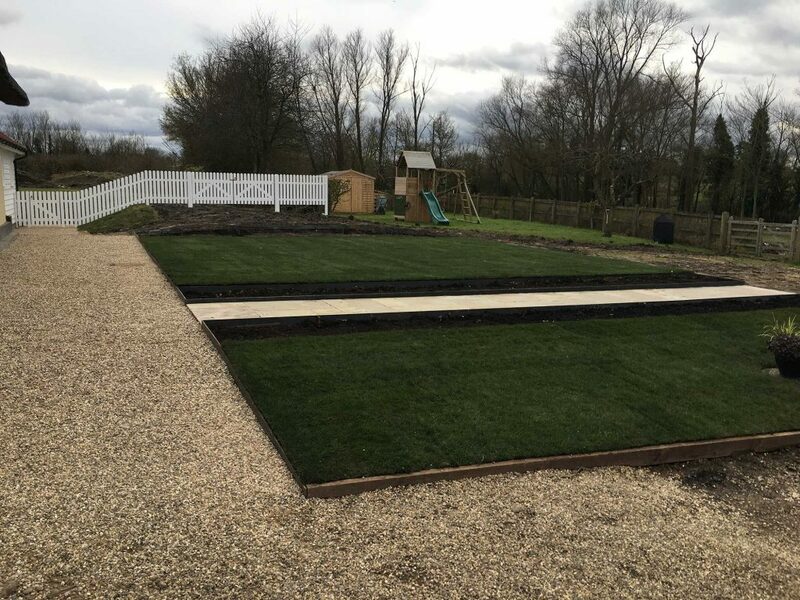 Imaginative garden design combined with good quality landscaping can make your garden into something very special. 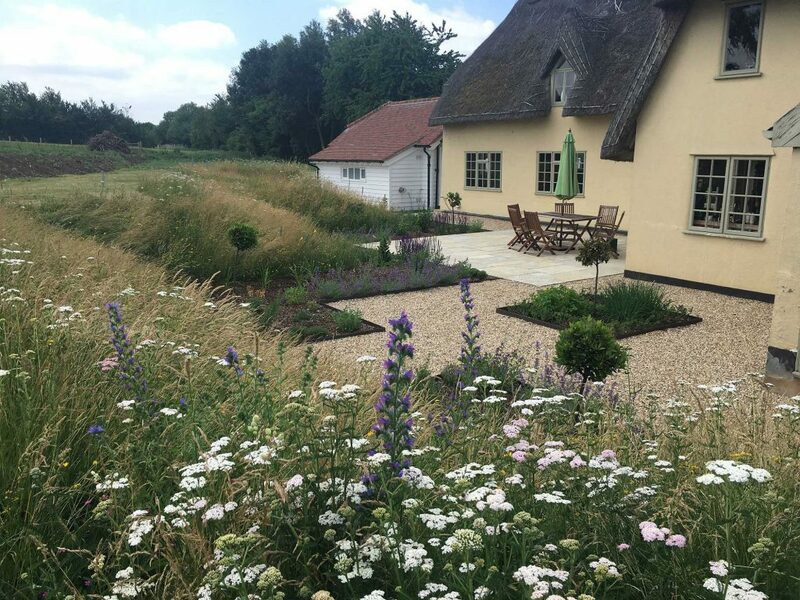 Find out what it could cost to build a country garden like this one?